At the foot of La Meije and Les Ecrins, the Chalet Alpin de La Bérarde mountain lodge is located in the heart of one of the largest alpine massifs. Many generations of mountaineers have visited the village of La Bérarde in the wake of Pierre Gaspard who made the first ascent of La Meije. 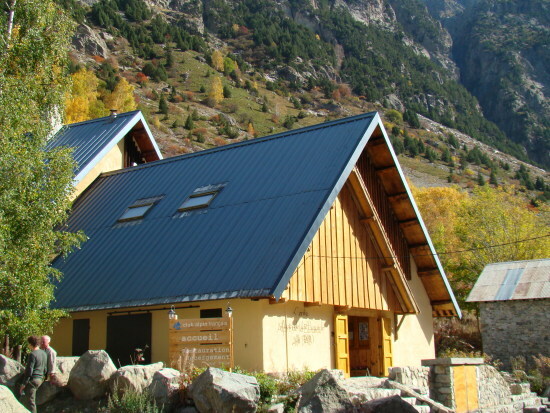 This comfortable and cosy chalet is an integral part of this unique village and at the confluence of many paths to the surrounding summits. You can leave your car behind and indulge yourself in walking, climbing, skiing or just relaxing. Ideal base camp for climbing the big races of the Ecrins. From 17/03 to 08/05, daily. From 09/05 to 01/06, daily. From 02/06 to 10/09, daily. From 11/09 to 16/03, daily. Half board (pp): 33.70 to 44.60 €. For information on tariff, discounts and bookings, please visit http://chaletlaberarde.ffcam.fr/tarifs.html. Depending on snow conditions, the road may be closed to traffic in the winter between Champhorent and La Bérarde, and as a consequence, the hamlets of Les Etages and La Bérarde may not be accessible by car. The road opens towards the end of March when the lodge reopens for the ski-mountaineering season.